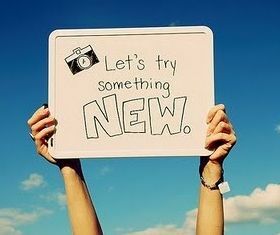 Don't be afraid to try something new. Mistakes are an important part of the learning process. Sometimes when you are pursuing a goal that you never had before you have to try new things in order to achieve it. Life is beautiful and adventurous. Life is full of experiments. Nobody is perfect and we all learn by mistakes so keep experimenting and trying new things in life. Success belongs to those who try to accomplish things no one attempted before. You are never too old to learn new things and to dream a new dream in life. Change is simply trying new things in a better way. The more you are willing to try the more opportunities you will seize in your life.